Those two days in Minnesota have been gloomy and pretty cold following the perfect hot summer days. 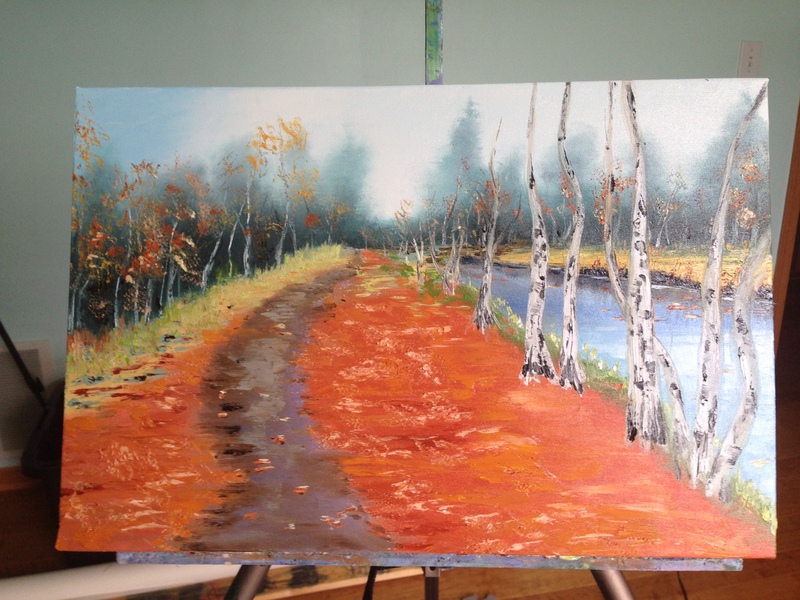 That inspired me to paint a fall scene with my favorite water reflections and gorgeous autumn colors. This time i had multiple reference photographs combined with my imagination which makes the result painting an imaginary place. A mid size palette knife was used to cover the sky with a mixture of blue, ultramarine, and white diluted with linseed oil on a prepared canvas surface ( I covered the blank canvas with some linseed oil to make the surface more flexible and suitable for work). I darkened the top left corner with more blue assuming that the light source was at the top right corner. The background trees were created again with palette knife, which picked up a mixture of green, blue and purple to trace the foggy shapes of the trees. 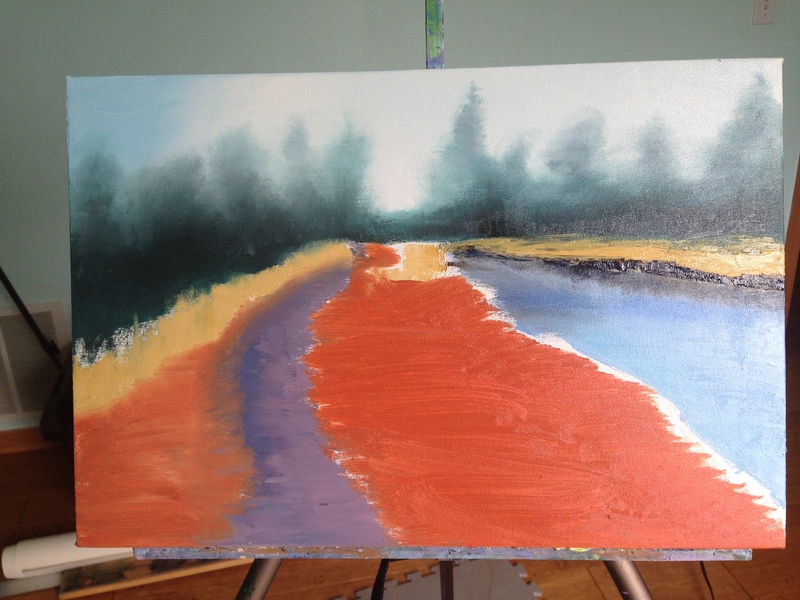 The knife carried the watery mixture of the paint to suggest the diffuse patches of the trees’ edges. I want to emphasize the importance of choosing the right paint’s consistency. At this point I used very watery/oily one to blend the sky and the background to reinforce the diffuse nature of the scene. 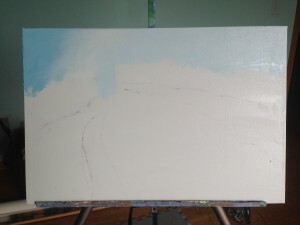 At his point I started using more of a creamy consistency of the paint. 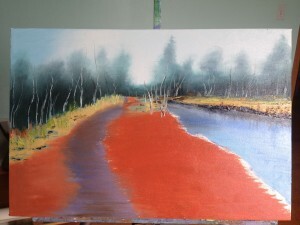 The foreground was strengthened with thicker strokes of almost out of the tube consistency. The warm orange-red-yellow combination emphasized the contrast with the cool sky and background. The subdued sunlight is reflected by the surface of the river and puddles, which contrasts beautifully with the sky layer above them. The sunlight on the birch trees is muted gold-gray-yellow. 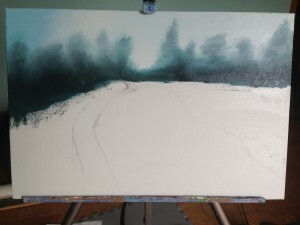 The contrast shadows of the trees were completed in different shades of purple. The thin parts of the trees were completed with the tip of a small brush working from bottom to the top. The painting was mostly created with thge palette knife. 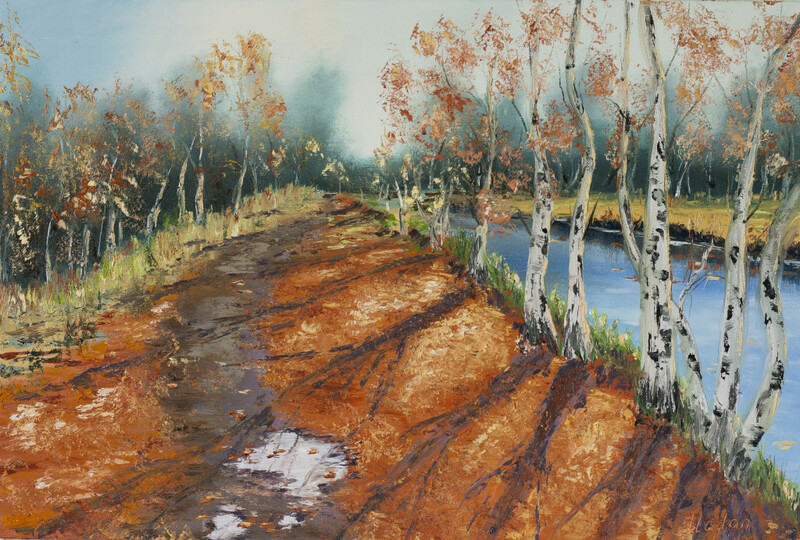 4 Comments on "Birch trees in the fall"
I really like this painting and I especially love how the little river/creek looks. I always seem to struggle with painting water. I just can’t seem to picture in my mind the way it’s supposed to look. I never thought about using pictures as somewhat of a guide to create a painting from your imagination, but I’ll have to remember to do that. Using one’s imagination isn’t always the easiest when trying to paint real life scenes. I think the painting looks awesome! Thanks for the inspiration. Thank you for the feedback! Yes I always need a reference material (photographs or real world aka “plein air”). I always wonder how others just use their imagination for painting! I love the colour in this, it’s stunning! The painting has turned out very bright and cheerful, and I was curious to see the process of creating it. Thank you for great blog post.